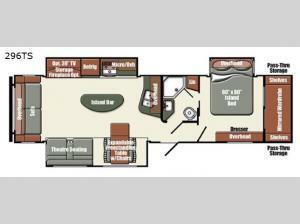 This GEO travel trailer is one of the most spacious and accommodating units on the market. The front, private master suite not only provides the comfort and seclusion that you are accustomed to having in your own home, but it also contains a large mirrored wardrobe which allows you to bring along all of your hiking boots, rain coats, or snow pants. The three slides that have been installed are what give this trailer its impressive space to house a kitchen island, and on top of all of that, there is additional exterior pass-through storage where you can put some of your larger equipment and luggage so that you don't clutter up the interior living areas.